Launch of TCD’s Centre for New Irish Studies (CNIS): Director: Dr. Mark Hennessy, Geography, School of Natural Science. The Centre for New Irish Studies was launched on 9 October by the Dean of Research, Professor Linda Doyle. The launch was marked by a panel discussion on “Interdisciplinary Research on the The Origins of the Irish People” presented by Dr Lara Cassidy (Postdoctoral Researcher, Genetics, TCD), Prof Dan Bradley (Genetics, TCD), Dr Rowan McLaughlin (Postdoctoral researcher, Palaeoecology, Queen’s University Belfast and Catalan Institute of Palaeoecology and Social Evolution) and Prof Jim Mallory (Professor Emeritus, Prehistoric Archaeology, Queen’s University Belfast). 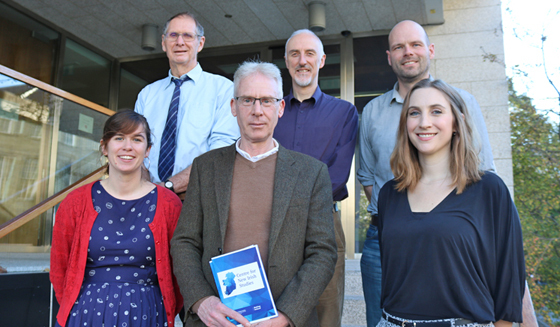 The CNIS emerges from Trinity’s strengths in Irish Studies research, particularly that undertaken by the 280 members of the Making Ireland research theme. The aim of the CNIS is to develop, promote and support research in Irish Studies in Trinity and also through partnership and engagement with researchers in the Irish and British Isles, Europe and across the world. CNIS will work extremely closely with the A-rated research theme Making Ireland, the other four arts and humanities-led research themes, and the Trinity Long Room Hub (TLRH), which hosts the Centre. The TLRH and CNIS share the aims of furthering Arts and Humanities research, promoting multi- and interdisciplinarity, and supporting public humanities; thus, the CNIS is well placed in this environment. This collaborative spirit allows the CNIS to contribute to achieving the Trinity College Dublin’s research strategies. Clockwise from bottom left: Lara Cassidy, Jim Mallory, Dan Bradley, Rowan McLaughlin, Sarah Kerr and Mark Hennessy.